The word Judaizer comes from Judaize, which is seldom used in English Bible translations (an exception is the Young's Literal Translation for Galatians 2:14). The Judaizing teachers were a group of Jewish Christians who taught that converts to Christianity must first be circumcised (i.e. become Jewish through the ritual of a proselyte). Although such requirements may have made Christianity a much less appealing religious choice for some Gentiles, the evidence afforded in Paul's letter to the Galatians exhibits that a significant number of the Galatian Gentile converts appear readily disposed to adopt these nomistic requirements; indeed, Paul strenuously labors throughout the letter (cf. Gal 5:4; 4:21; 5:2,3) to dissuade them from doing so. Paul saw these teachers as being both dangerous to the spread of Christianity and propagators of grievous doctrinal error. Many of his letters included in the New Testament (the Pauline epistles) contain considerable material disputing the view of this group and condemning its practitioners. Paul publicly condemned Peter for his seemingly ambivalent reaction to the Judaizers, embracing them publicly in places where their concepts were popular while holding the private opinion that the teachings were erroneous, for example 1 Cor 9:20–23. That Gentile Christians should obey the Law of Moses was the assumption of some in the Early Church, as represented by Pharisees who had become believers in Acts 15 (Acts 15:5). Paul opposed this position, concluding that Gentiles did not need to convert and obey the entire Law of Moses. The conflict between Paul and his opponents over this issue came to a head with the Council of Jerusalem. According to the account given in Acts 15, it was determined that Gentile converts to Christianity did not have to go through circumcision; but in addressing the second question as to whether or not they should obey the Torah, they encouraged the Gentiles to "abstain from things sacrificed to idols, and from blood, and from things strangled, and from fornication". Also Paul warned the early Galatian church that Gentile Christians who submit to circumcision will be alienated from Christ: "2 Indeed I, Paul, say to you that if you become circumcised, Christ will profit you nothing. 3 And I testify again to every man who becomes circumcised that he is a debtor to keep the whole law. 4 You have become estranged from Christ, you who attempt to be justified by law; you have fallen from grace." (Galatians 5:2–4). The Catholic Encyclopedia notes: "Paul, on the other hand, not only did not object to the observance of the Mosaic Law, as long as it did not interfere with the liberty of the Gentiles, but he conformed to its prescriptions when occasion required (1 Corinthians 9:20). Thus he shortly after circumcised Timothy (Acts 16:1–3), and he was in the very act of observing the Mosaic ritual when he was arrested at Jerusalem (21:26 sqq.)." Probably the best description of Judaizers is in Acts 15:1: "And certain men came down from Judea and taught the brethren, and said, 'Unless you are circumcised according to the custom of Moses, you cannot be saved. 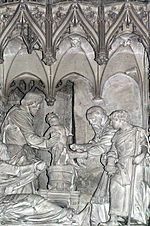 '… Circumcision performed for the purpose of being "saved" meant a full, formal conversion to Judaism, complete with a baptism into Judaism and an embracing of the rabbis' entire Oral Law (probably the law that Peter had in mind when he referred to "a yoke ... which neither our fathers nor we were able to bear) ... The Judaizers believed that this conversion process would turn the Gentile believer into a full-fledged Jew, and that without this the Gentile could not be saved. Without a complete, formal conversion to Judaism, the Gentile believer could not become a full-fledged member of the saved Messianic Community, the Judaizers said ... No Scripture-loving Jew could describe the written Torah as an unbearable yoke. See Psalm 19 and Psalm 119. —  Daniel Botkin, "Who Were the Judaizers?" Judaizing teachers are strongly condemned in the Epistle of Barnabas. (Although it did not become part of the Christian Biblical canon, it was widely circulated among Christians in the first two centuries and is part of the Apostolic Fathers.) Whereas Paul acknowledged that the Law of Moses and its observance were good when used correctly ("the law is good, if one uses it lawfully", 1 Tim 1:8), the Epistle of Barnabas condemns most Jewish practices, claiming that Jews had grossly misunderstood and misapplied the Law of Moses. Justin Martyr (about 140) distinguishes two kinds of Jewish Christians: those who observe the Law of Moses, but do not require its observance of others — with these he would hold communion – and those who believe the Mosaic law to be obligatory on all, whom he considers heretics (Dialogue with Trypho 47). Christian groups following Jewish practices never completely vanished, although they had been designated as heretical by the 5th century. Skhariya or Zacharias the Jew from Caffa led a sect of Judaizers in Russia. In 1480, Grand Prince Ivan III invited some of his prominent adherents to visit Moscow. The Judaizers enjoyed the support of high-ranking officials, statesmen, merchants, Yelena Stefanovna (wife of Ivan the Young, heir to the throne) and Ivan's favorite deacon and diplomat Fyodor Kuritsyn. The latter even decided to establish his own club in the mid-1480s. However, in the end Ivan III renounced his ideas of secularization and allied with the Orthodox Christian clergy. The struggle against the adherents was led by hegumen Joseph Volotsky and his followers (иосифляне, iosiflyane or Josephinians) and Archbishop Gennady of Novgorod. After uncovering adherents in Novgorod around 1487, Gennady wrote a series of letters to other churchmen over several years calling on them to convene sobors ("church councils") with the aim "not to debate them, but to burn them." Such councils were held in 1488, 1490, 1494 and 1504. The councils outlawed religious and non-religious books and initiated their burning, sentenced a number of people to death, sent adherents into exile, and excommunicated them. In 1491, Zacharias the Jew was executed in Novgorod by the order of Ivan III. At various times since then, the Russian Orthodox Church has described several related Spiritual Christian groups as having a Judaizing character; the accuracy of this label – which was influenced by the early Christian polemics against Judaizers – has been disputed. The most famous of the Russian Empire's Judaizing sects were the Karaimites or Karaimizing-Subbotniks like Alexander Zaïd who successfully settled in the Holy Land. The Epistle to the Galatians strongly influenced Martin Luther at the time of the Protestant Reformation because of its exposition of justification by grace. Nevertheless, various sects of Messianic Jews such as Jews for Jesus have managed to stake out territory for themselves in the Protestant camp. This behavior was particularly persecuted from 1300 to 1800 during the Spanish and Portuguese Inquisitions, using as a basis the many references in the Pauline epistles regarding the "Law as a curse" and the futility of relying on the Law for attaining salvation, known as legalism. Thus, in spite of Paul's agreement at the Council of Jerusalem, Gentile Christianity came to understand that any Torah Laws (with the exception of the Ten Commandments) were anathema, not only to Gentile Christians but also to Christians of Jewish extraction. Under the Spanish Inquisition, the penalty to a converted Jew for "Judaizing" was usually death by burning. The Spanish word Judaizante was applied both to Jewish conversos to Catholicism who practiced Judaism secretly and sometimes to Jews who had not converted, in Spain and the New World at the time of the Spanish Inquisition. The term "Judaizers" was used by the Spanish Inquisition and the inquisitions established in Mexico City, Lima, and Cartagena de Indias for Conversos (also termed Marranos) accused of continuing to observe the Jewish religion, as Crypto-Jews. Entry of Portuguese New Christians into Spain and the Spanish realms occurred during the Union of Crowns of Spain and Portugal, 1580-1640, when both kingdoms and their overseas empires were held by the same monarch. The Bnei Anusim are modern day Hispanic Judaizers. Old Testament practices are still adhered to among Gentiles to this day, including circumcision (see also Biblical law in Christianity). The Coptic churches continue to practice circumcision, but critics charge this may reflect ancient Egyptian influence or be a response to the culture of the Islamic majority (see also Abrahamic religions and Circumcision controversy in early Christianity). In Torah-submissive Christian groups which include the Ethiopian Orthodox church, dietary laws and Saturday Sabbath are observed as well. The prohibitions against fornication and idolatry are still observed by most Christian denominations although these appear in Jewish law. Escobar Quevedo, Ricardo. Inquisición y judaizantes en América española (siglos XVI-XVII). Bogota: Editorial Universidad del Rosario, 2008. Márquez Villanueva. Sobre el concepto de judaizante. Tel Aviv: University Publishing Projects, 2000. ^ Greek New Testament, Galatians 2:14 ἀλλ᾽ ὅτε εἶδον ὅτι οὐκ ὀρθοποδοῦσιν πρὸς τὴν ἀλήθειαν τοῦ εὐαγγελίου εἶπον τῷ Πέτρῳ ἔμπροσθεν πάντων Εἰ σὺ Ἰουδαῖος ὑπάρχων ἐθνικῶς ζῇς καὶ οὐκ Ἰουδαϊκῶς τί τὰ ἔθνη ἀναγκάζεις Ἰουδαΐζειν. ^ Michele Murray Playing a Jewish Game: Gentile Christian Judaizing in the First and Second Centuries CE, Canadian Corporation for Studies in Religion - 2004 p33 "From Paul's perspective, by withdrawing from Gentile table fellowship, Peter was sending a message to the Gentile believers of Antioch. The message to Antiochene Gentile Christians was that they were to judaize." ^ Bowker, J., "Judaizers", The Concise Oxford Dictionary of World Religions (1997). ^ "CATHOLIC ENCYCLOPEDIA: Judaizers". www.newadvent.org. Retrieved 2018-03-20. ^ Daniel Botkin. 2001, March–April. Volume 07.pdf Who Were the Judaizers? Gates of Eden. ^ ""Flavius Josephus. The Wars Of The Jews. Book II, chapter 8.14"". Archived from the original on April 28, 2005. ^ "Flavius Josephus, The Wars of the Jews", William Whiston, A.M., Ed., John E. Beardsley. 1895. Book II, Whiston Section 461. Tufts.edu, Tufts University. ^ "St. Ignatius of Antioch to the Magnesians (Roberts-Donaldson translation)". Earlychristianwritings.com. 2006-02-02. Retrieved 2011-09-16. ^ "NPNF2-14. The Seven Ecumenical Councils | Christian Classics Ethereal Library". CCEL.org. 2005-06-01. Retrieved 2011-09-16. ^ McGrath, Alister E. Christianity: An Introduction. Blackwell Publishing (2006). ISBN 1-4051-0899-1, page 174. ^ Eric Plumer Augustine's Commentary on Galatians: Introduction, Text, Translation, and Notes p124 footnote "5 Literally, 'who were compelling Gentiles to Judaize (Latin: iudaizare)'—in other words, '... to live in accordance with Jewish customs'. In the Latin Bible the term occurs only at Gal. 2: 14, where it virtually transliterates the Greek ioudaizein"
^ under Louis H. Gray's entry "Judaizing" section 8 "Recrudescent forms" subsection C "Karaimites" on page 612 in Volume 7 of "Encyclopædia of Religion and Ethics" HardPress. 2013. Gray, Louis Herbert (1914). "Judaizing". In Hastings, James (ed.). Encyclopædia of Religion and Ethics. 7. T and T Clark, Edinburgh. p. 612. ^ Seymour B. Liebman The inquisitors and the Jews in the New World 1975 "The term Judaizante was applied to Jewish apostates to Catholicism who practiced Judaism secretly. In some instances the term was synonymous with Jew." ^ Zumárraga and the Mexican Inquisition, 1536-1543 "The first activity of the Mexican Inquisition against Jews and Judaizantes came in 1523 with the ordinance against heretics and Jews." ^ Ricardo Escobar Quevedo. Inquisición y judaizantes en América española (siglos XVI-XVII).Bogota: Editorial Universidad del Rosario, 2008. ^ Márquez Villanueva. Sobre el concepto de judaizante. Tel Aviv : University Publishing Projects, 2000. "The Coptic Christians in Egypt and the Ethiopian Orthodox Christians — two of the oldest surviving forms of Christianity — retain many of the features of early Christianity, including male circumcision. Circumcision is not prescribed in other forms of Christianity... Some Christian churches in South Africa oppose the practice, viewing it as a pagan ritual, while others, including the Nomiya church in Kenya, require circumcision for membership and participants in focus group discussions in Zambia and Malawi mentioned similar beliefs that Christians should practice circumcision since Jesus was circumcised and the Bible teaches the practice." "The decision that Christians need not practice circumcision is recorded in Acts 15; there was never, however, a prohibition of circumcision, and it is practiced by Coptic Christians." "circumcision" Archived 2007-08-08 at the Wayback Machine, The Columbia Encyclopedia, Sixth Edition, 2001-05. ^ "The Ethiopian Orthodox Tewahedo Church". cnewa.org. Catholic Near East Welfare Association. Retrieved 31 October 2015.